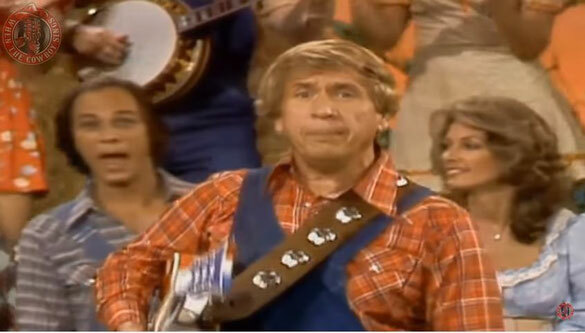 Buck Owens And The Whole Hee Haw Gang performs "Crawdad Song"
Buck Owens And The Whole Hee Haw Gang performs "Crawdad Song" on the Hee Haw show 1979. "Crawdad Song"This song evolved from Anglo-American play-party traditions and African-American blues. Workers building levees to prevent the flooding of the Mississippi River in the South were among the first to sing it. Hi. This lyric, which I transcribed from a 1946 Woody Guthrie version, and which you obviously copied from my site, is very different from the lyric sung by Buck Owens et al in this version. As far as I know, this lyric is unique to a specific 1946 Guthrie recording. In one section he refer five times to the blues and folk musician Sonny Terry, who is one playing the harmonica on the recording.